When I originally started working on this project I told Evangeline I was going to make her a poncho. She let me know that she didn't have any desire for a poncho. (That's exactly what every seamstress wants to hear halfway through a project! Guess I've still got some work to do with those manners.) 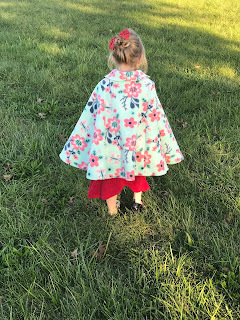 I decided to call this project a cape and she was elated! Kids can be so funny! Evangeline loves watching me sew when she isn't busy working on her own art projects. It's been a while since I actually sewed a pattern that involved fleece fabric! I picked up this adorable fleece fabric from JoAnn Fabrics last spring along with Simplicity Pattern 8524 (D0852). 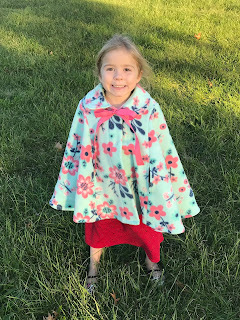 The pattern includes some great tips for sewing with fleece so be sure to read those if you end up making this pattern. I did use a ball point needle and tried out some new zig-zag stitches on my Babylock. I ended up using stitch #9 on my Babylock Soprano which worked like a dream. Overall this was a great project and would really make a wonderful Christmas present for the little girl in your life. It sews up very quickly and fleece fabric seems to always be on sale. If the child you make this for is still in a regular car seat like my daughter, they will love being able to actually wear this while they are buckled in their seat! Simply flip the back part up while you buckle them in and then the poncho (cape) will be over top of their car seat buckles keeping them both safe and warm. What have you been sewing lately? Do you have any plans to make or sew any Christmas presents? Ah May Reads. Two thumbs up for summer reading. Our library actually pays adults in library cash to read. Translation: If I spend lots of time reading this summer I won't actually have to use real American currency to pay those pesky library finds. If I actually return my books on time (I usually don't) then I can spend it all at the used book sale. It's a fabulous win win either way. 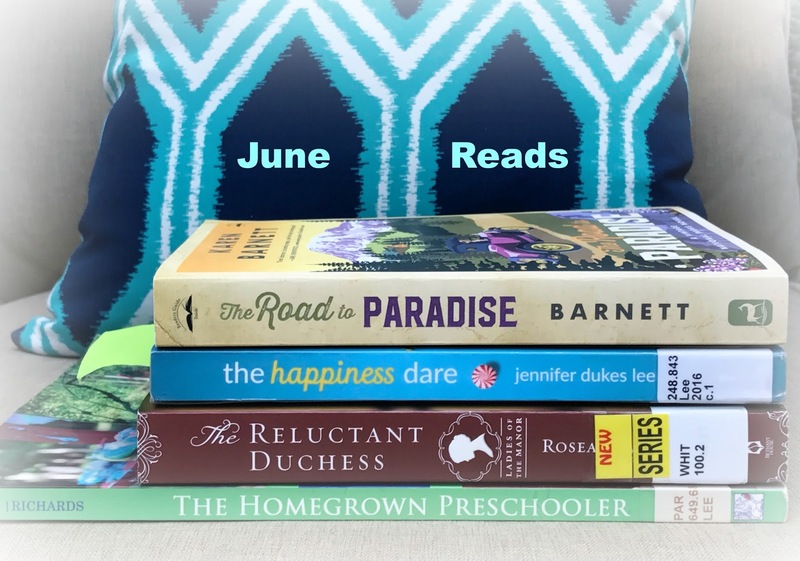 Here's a look at what I read in the month of May. 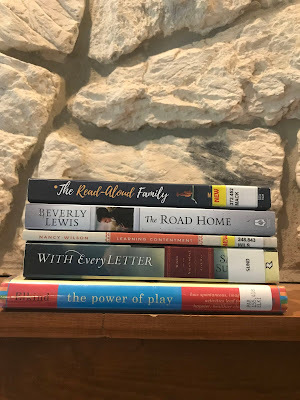 The Read Aloud Family by Sarah Mackenzie: I have enjoyed listening to Sarah Mackenzie's podcast "The Read Aloud Revival" for years. When I found out she was writing a book on reading aloud to your children I jumped at the chance to read it. I loved this book. Mackenzie's book was such an encouragement and just a plain delight to read. Not only does reading aloud have the power to change your family, but it also has the power to change the world. Reading remains a high priority in our family and I hope to continue the tradition even when all of our children can read on their own. The Road Home by Beverly Lewis: This was just the book I needed to jump start my unofficial summer reading. When a tragedy strikes her family, eighteen year old Lena is sent to Pennsylvania to help in her Mimi's sewing business. As a fellow seamstress I always love when Lewis includes a bit of sewing in her books. Lena continues to dream of being reunited with her siblings in Michigan all while her long distance relationship with Hans starts to fizzle. This book was just like watching a Hallmark movie unfold on the page. I found it very hard to put this book down. Once again I am just amazed at the output of Beverly Lewis. I'm pretty sure she releases not just one but two fiction books per year. (My mother and I had the privilege of hearing her speak a few years ago which was such a neat experience.) Please note that I did receive a copy of this book from Bethany House. All opinions are my own. Learning Contentment by Nancy Wilson: This book was amazing and yet so soul piercing. I found it so helpful that I took the time to record notes in a journal since this was actually a library book. The chapters are short and very manageable. The end of each chapter includes 5 questions which are so helpful. I also took the time to journal these and that is saying something since that usually only happens a few times a month. This would also be a great book to read in a small group. I highly recommend this book. With Every Letter by Sarah Sundin: This is the story of Lt. Mellie Blake, a flight nurse who begins writing to a man she has never met as part of a morale-building program. Lt. Tom MacGilliver jumps at the opportunity to correspond anonymously. As fate would have it they develop an actual real life friendship before they connect the dots with their letter writing to one another. This book was fascinating and another page turner. I look forward to reading more from Sundin in the future. The Power of Play by David Elkind: I had a lot of high hopes for this book. I agree with the importance of play and how crucial it is for parents to actually make free play happen. Unfortunately this book was just so boring. I plowed through about half of it before deciding to abandon the book. I took my kids to the creek instead of finishing the book. Case for Life by Scott Klusendorf: I enjoyed reading Klusendorf's book which encourages Christians to really take a stand for life and for truth. The book is clearly laid out into four parts. The first part helps Christians to simplify debates over abortion and embryonic stem cell research. The second section shows how moral neutrality is really impossible. The third section helps Christians to answer common objections. This section was so good as it really tackled some hard cases. The final section addresses questions related to pastors including whether or not it is okay to join hands with other religions to protect life. I wholeheartedly agree that yes it is okay to join hands with others for the sake of saving lives. The book also talks about how to give hope to post-abortive men and women. I love the author's grace filled approach. Overall this book was clearly laid out and really helped me to think about hard issues that I honestly don't think about enough. I highly recommend this book. Please note that I did receive a review copy of this book from Crossway Publishing. All opinions are my own. Do you find yourself gravitating towards a certain genre of books in the summer? I'm finally posting my February Reads which means that spring is just around the corner! Hooray! Is anyone else already dreaming of summer vacation? I've caught myself more than once dreaming about reading curled up in a comfy chair and reading in our backyard. Make it Happen by Lara Casey: This book escaped my picture but it was delightful. I loved the sweet insights into Casey's life. Her testimony is a beautiful example of the Lord's grace as she sings His praises throughout each chapter. I have been following her Instagram account for a while and began using her Power Sheets last summer. I really enjoyed this book and would definitely recommend it. Rethinking School: How to Take Charge of Your Child's Education by Susan Wise Bauer: I absolutely loved Bauer's advice on taking control of your child's K-12 experience. She advocates learning to flex the system so that it fits your child vs. the other way around. In this book the author also discusses learning difficulties and intellectual giftedness. Bauer also touches on the sheer craziness of children spending many hours on homework at the expense of family priorities. I did learn a lot about traditional education from this book and would definitely recommend this book to any parent. It definitely made me think as we continue to pray about the future of education for our children. Reading Magic: Why Reading Aloud to Our Children Will Change Their Lives Forever by Mem Fox: One of the things our family is really passionate about is reading aloud. It is seriously a non-negotiable in our home. Having enjoyed other books about reading aloud, I was delighted to pick up this book at the library. The first few chapters were okay but honestly I quickly lost interest. If you are interested in a book about reading aloud I encourage you to check out Jim Trelease or Gladys Hunt. Before We Were Yours by Lisa Wingate: This was a poignant and beautiful novel which takes place in Memphis, 1939. Wingate's novel plunges the reader into the dark history of the Memphis TN Children's Home Society under the leadership of Georgia Tann. The story shifts between past and present but not in a way that drives me crazy. No doubt this is an unforgettable read and I am confident I will always be reminded of this book when we pass the real life Mud Island in Memphis, TN. 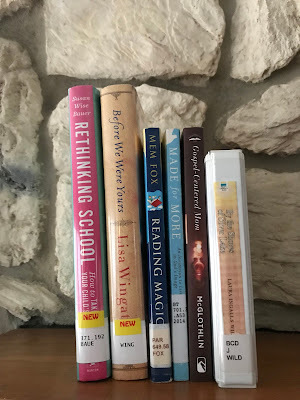 Gospel Centered Mom: The Freeing Truth About What Your Kids Really Need by Brooke McGlothlin: I was eager to start reading this book once I realized that the author was a boy mom. One of the things I have really struggled with as a parent is the feeling that I am not enough. I find that I need to remind myself constantly of the good news of the Gospel and how it relates to my parenting! This book was a nice reminder. I especially enjoyed the author's guided prayer and wish that she would have included more prayers in this book. She also included many quotes from different theological backgrounds which I found interesting. Please note that I did receive a review copy of this book from Blogging for Books. All opinions are my own. By the Shores of Silver Lake by Laura Ingalls Wilder: I'm thrilled to continue passing on my love of the "Little House" books to my children. My sweet mama introduced me to the series as a young girl and I've been quite a fan ever since then. Eli and Eva both really enjoy listening to the stories. This month I noticed Eva really began to take many of the stories to heart and we talked often about life for Laura and Mary. I definitely predict that we will be sewing bonnets by the end of summer. The Trumpet of the Swan by E.B. White: My children and I really enjoyed this delightful book by the author of Charlotte's Web. It is the delightful story of a young swan named Louie who is born mute. I think I enjoyed this story just as much as my children did. What books did you read last month? I would love to hear all about it in the comments. 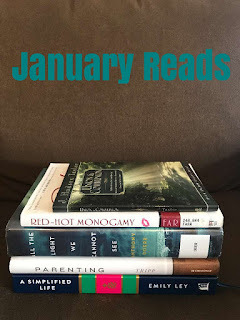 I ended up reading 5 personal books in January and they were all pretty good. I'm really thankful after last months reading! Looks like I'm on track to hit my goal of 52 books this year. We also finished up two children's books. Although it wasn't intentional, I am glad to see a little more variety in the books that I read this month. Last month almost everything I read was fiction. All the Light We Cannot See by Anthony Doerr: This book contained two parallel stories set during World War II. A bright, young orphan boy named Werner lives in Nazi Germany when he becomes spellbound by a nightly science program broadcast from France. Mari-Laure is a clever girl who lives in Paris, France with her locksmith father who works in an art museum. When she goes blind her father builds her a detailed miniature model of their neighborhood. Germans invade and Marie-Laure and her father must flee to the town of Saint-Malo to live with her great uncle. For the most part I enjoyed this book. The one thing that really drove me bonkers was the fact that the story goes back and forth in time. I found it a little difficult to keep the story straight since I often read in the stolen snippets of time. This was our book club pick for January and it was really fun to discuss this book. This book was packed full of truth and encouragement. It was Gospel centered and incredibly convicting. I have already started to apply the truths found in this book and I can already notice a difference in my own heart. I would say this a must read for every parent especially if your children are past the toddler stage. A Simplified Life: Tactical Tools for Intentional Living by Emily Ley: After a busy Christmas season I was ready to dive into a book that talked about simplifying things. I loved Ley's practical strategies and tips for prioritizing what really matters in life. This book is divided into ten key areas: your home, style, meals, schedule, finances, hospitality, technology, self care, motherhood, and faith. I found this book helpful as I worked through my goals for the 2018. This book is also stunning. I loved the beautiful photographs included throughout the book and plan on purchasing a copy as a gift. Red-Hot Monogamy by Bill and Pam Farrel: This book was really good and a great reminder to prioritize my own marriage. It also included well over 100 romantic ideas which were actually really good. I would definitely recommend this book if you are married. The Austen Escape by Katherine Reay: In this book Mary Davies finds her productive, organized life turned upside down when she heads to England with her estranged, best friend from childhood. Things in England prove to be eventful when her friend Isabel looses her memory. Isabel is convinced that she lives in Regency England. This book was delightful and the second book that I have read by Ms. Reay. Her other book Dear Mr. Knightly is wonderful. God's Word by Sally Michael: The children and I really enjoyed reading this book together. It is packed full of Scripture and I absolutely love the illustrations that the author includes. This book generated a lot of really good discussion and prayer this month. It is the third book that we have read in the Making Him Known series. We plan to read God's Design next. Prepare Him Room: Celebrating the Birth of Jesus Family Devotional by Marty Machowski: This was our Advent devotional that we wrapped up early in January. The devotions were Gospel centered and also included song selections which we sang together. There were also some family activity ideas that we didn't always get to and that's okay. I really appreciated the fact that there were just three devotionals each week. I didn't get overwhelmed or feel like I fell behind. The book also included a longer story that was four chapters long about a group of orphan children. Overall a delightful book that we plan to read next Christmas. Only one book was from my "unread" shelf. I'm actually a little scared to count how many books are on that shelf! This year I would like to read 12 books that I already currently own. 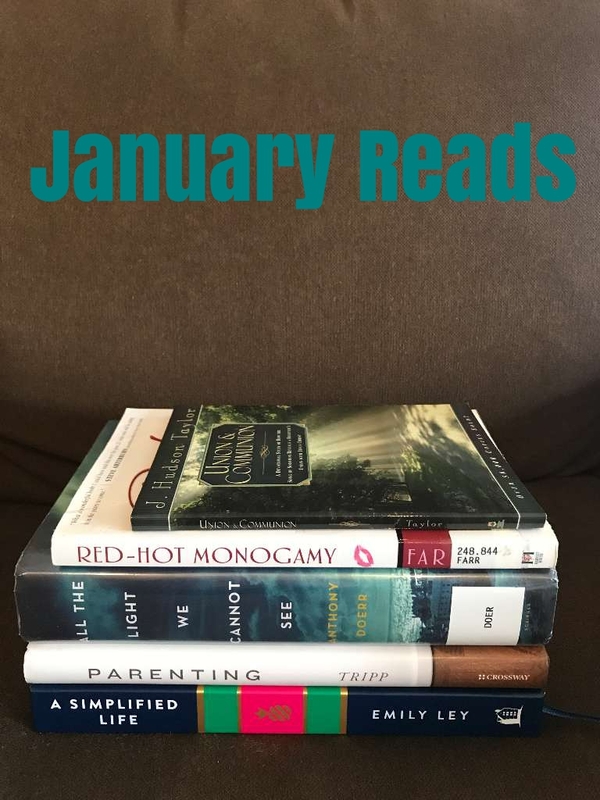 What books did you read in January? Do you find it easier to read during the winter months? While I usually make it a point to read books of different genres that didn't really happen this month. It was almost straight fiction. Should I blame it on the road trips or poor planning? Most of these are light fiction reads that I read as we traveled this month. The Ladies of Ivy Cottage by Julie Klassen: This is the second book in the Tales from Ivy Hill series. Since I read the first book, The Innkeeper of Ivy Hill last month, I had high expectations for this book. The first book in the series was quite the page turner and I definitely stayed up past bedtime to finish it! The story line continues in this second book where the reader learns more about Miss Rachel Ashford. She opens a circulating library to help alleviate her difficult financial circumstances after her father's passing. Along the way Miss Ashford discovers a number of mysteries as she deals with her own complicated friendships. The second book moved a little too slow for my taste. I read the majority of this book on a long road trip but I was a little disheartened when I realized that the book really wasn't keeping my interest. This book clocks in at over 400 pages which is just ridiculous. I do feel as though I am fairly committed to the series at this point and I might just want to know what happens to the rest of the characters. I probably would pick up the next book in the series if I happen to see it at my local library but I won't be going out of my way to purchase it. Please note that I did receive a review copy of this book from Bethany House. All opinions are my own. Loving my Actual Christmas by Alexandra Kuykendall: I'm sure that everyone would agree that they dream of enjoying the Christmas season more instead of being swept up into the craziness. I purchased this book with that thought in mind since it had received rave reviews. Surprisingly, nothing in the book was really earth shattering. Most of the tips were things that my family and I already practice in our home. For example Kuykendall encourages the reader to set realistic expectations, not to be afraid of saying no, and to focus on the real meaning of Christmas. The best piece of advice or takeaway from this book included the advice about the 12 Days of Christmas. The author encourages the reader to celebrate the 12 Days of Christmas from Christmas Day (December 25) to Epiphany (January 6). I'm happy to share that this was actually something that my parents passed onto me and it is a tradition that we have embraced in my own family. I cannot tell you how much this helps increase our joy and enjoyment of the Christmas season. 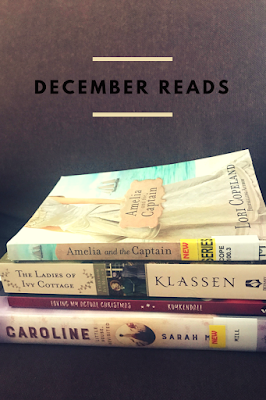 Amelia and the Captain by Lori Copeland: If you haven't already noticed, I really enjoy reading an entire genre of books I like to call Hallmark movie books. They are always lighthearted, clean fiction books that are just pure fun. I always try to have a "Hallmark movie book" with me on a long road trip because I am often interrupted and appreciate not having to follow a complicated story plot while I am helping care (and entertain) children in the car. In this book swindler Amelia finds herself clinging for life when she runs into Union Captain Morgan Cane. The story progresses and involves a shady villain who attempts to kidnap and steal Amelia. All that to say this book was just okay and I don't plan on reading any other books in this series. Caroline: Little House, Revisited by Sarah Miller: I was pleasantly surprised to find this book on the new books shelf at the library. I've been a "Little House" fan since the time my sweet mama opened up Little House in the Big Woods and read it to me while I was tucked in at night. The book drew me in from the very beginning as Miller retells the story through the eyes of Ma. Unfortunately there was a scene in the book where the author shares a little too much about the intimate married life of the Ingalls. I just think that was totally unnecessary and really kind of soured the rest of the book. Well I guess it was rather a disappointing month for reading after all. Overall every single book I read in December was a let down. Nevertheless I"m really excited about some of the books I'm reading right now! I'm also excited for more time this month to curl up by the fire with a good book so please share! What books are you reading right now? Have you read any of these books? I forgot to hit publish a few months ago but I wanted to go ahead and share this post anyway. I so enjoy getting a glimpse into the reading life of my friends. After reading only one disappointing book in August I was determined to make up for lost time in September! I was much more observant of how I was using small pockets of time and found that I was able to read quite a nice pile of books! It was very humbling to discover I could read this many books in the amount of time I usually spent scrolling social media. I made sure to take a book with me on any errand even I didn't possibly think I would have any time to read. In September we also flew to Texas so I read two of these books on the plane. Still Waiting: Hope for When God Doesn't Give You What You Want by Ann Swindell: I loved hearing the author share her compelling story of waiting for healing. It was both fascinating and incredibly encouraging to see her cling to the cross despite her suffering. In the book Swindell retells the story of the woman with the issue of blood with keen insights into what life must have been like for her. This book was honest and Gospel centered. I look forward to reading more books by Swindell in the future. Daring to Hope: Finding God's Goodness in the Broken and the Beautiful by Katie Davis Majors: Having read the author's first book Kisses from Katie years ago, I was eager to read her second. What a beautiful story of what God has done in and through the author's life in Uganda. Majors moved to Uganda over a decade ago where she founded Amazima Ministries. Today she continues to serve the people there while also being a wife and mother to over a dozen children. I appreciated Majors' honesty about the real struggles that she faces on a day to day basis and how the Lord has met her each time. This book was challenging and inspired me to fully invest in the lives of those around me. Please note that I did receive a review copy of this book from Blogging For Books in exchange for my review. Notes from a Blue Bike: The Art of Living Intentionally in a Chaotic World by Tsh Oxenreider: In a world that's always encouraging us to do more, I appreciated Oxenreider's advice to slow down. I loved hearing her share about her journeys and her struggles. I could also really appreciate her love of travel and adventurous spirit. I've always enjoyed traveling but I think the older I get the more important it becomes. Most of our traveling centers around visiting family & friends but our family also hopes to add some unique travel destinations in the future. I so enjoyed the author's book and would definitely recommend it. The Sound of Gravel by Ruth Wariner: This memoir was absolutely captivating. What a touching story of the courage of Wariner's escape from the fundamentalist Mormon cult where she grew up. Amazingly, Ruth Wariner was also able to rescue and raise her three younger sisters. The author is a fabulous writer and it was really hard to put this book down. I finished it the next day as soon as I could steal away some time. Alive in Him: How Being Embraced by the Love of Christ Changes Everything by Gloria Furman: I am so very thankful for each Gloria Furman's books. This one was no different. Throughout the book Furman leads the reader deeper into the biblical text of the book of Ephesians. She shares the mains themes of the book and that the blessings believers have received in Christ empower us to walk in a new way. I spent an entire semester studying Ephesians in depth with the ladies of my college church and every time I think of the book of Ephesians I get excited. This book is nice to read alongside the book of Ephesians. A Charlotte Mason Education: A Home Schooling Manual How-To Manual by Catherine Levison: While I'm definitely a fan of Charlotte Mason education in general I just couldn't get into this book. The chapters were very short and more of a concise summary. I really appreciate a little more meat to a book. Sir Gawain and the Green Night by Michael Morpugo (adaptor): My kids really enjoyed this book especially Eli. What seven year old boy wouldn't enjoy a delightful tale about a knight! I do think the book would be better suited for children who are slightly older. My Father's Dragon by Ruth Stiles Gannett: I read this delightful tale aloud last week to the children. One was down sick so this was the perfect fantasy tale to lift their spirits. This is the first in a series and we plan to read the next one soon. Life of Fred: Apples by Stanley Schmidt: This book weaves together elementary math principles into a story. Eli & Eva both found it delightful. I thought it was okay and a fun math supplement. I love reading so I am always up for adding in some fun living books! Ah June! A month filled with a few lazy afternoons and a long road trip. The perfect combination for reading through a delightful pile of books. (Not all books are in the photo.) I am trying to read a broad variety of books but something about summer continues to steer me straight to the fiction section. Does anyone else have this problem only in the summer months? Nevertheless here is a look at what I read last month. When People Are Big and God is Small by Ed Welch: This was a fantastic, thoughtful book which I worked through the past few months. Over and over again this book helped me to see areas where I need to think more biblically. The end of each chapter also includes 3-4 questions and applications. While I really enjoyed working through this book, I think it would be even more fantastic to read through with a close friend or small group. The Road to Paradise by Karen Barnett: I loved reading this "vintage national parks novel" set in 1927. It tells the tale of Margaret Lane, an avid naturalist who lands a job working at Mt. Rainer National Park. This book was perfect to take along on our last road trip. I love being outside and try to squeeze in as much hiking as our schedule allows. The book was fast paced and very engrossing. Please note that I did receive this book in exchange for my review from Blogging For Books. The Happiness Dare by Jennifer Dukes Lee: I picked up this book after listening to the author on The Busy Mom podcast. The author was fabulous on the podcast and I knew at once I had to get my hands on her book. Summer tends to make me really happy and it also makes me very reflective. I did feel a bit silly picking up a book on happiness when it isn't really something I'm struggling with in my life. In the book the author addresses the five different happiness styles: experiencer, doer, thinker, giver, and relater. I did take the time to take the online test but I came back as a close mixture of three rather than just one clear type. This book was good but I had mixed feelings about it. I can't really put a finger on it but perhaps it is just the topic? The Reluctant Duchess by Roseanna M. White: I randomly picked up this book at the library and wow was it good! If you are a fan of the popular Downton Abbey you are sure to love this thrilling book about Lady Rowena Kinniard, a Highland heiress. Lady Rowena questions whether she can marry someone who is mixed up in some questionable business. This book was delightful. It's actually the second book in the "Ladies of the Manor" series so you may prefer to read the first book in the series before this one. I didn't and had no trouble following the plot. The Homegrown Preschooler: Teaching Your Kids in the Places They Live by Kathy H. Lee & Lesli M. Richards: I really enjoyed this thoughtful book brimming with ideas! It was jam packed with wonderful activities to help your child learn while going about their day. I found this book to be so invaluable that I even took notes on it! I made numerous lists of activities to enjoy with Evangeline this summer and into the fall months. The only thing that drove me crazy in this book were the unprofessional, poor quality photographs. If you can get past the photos this book is filled to the brim with fantastic ideas! What books are you reading this summer? Do you tend to read more or less in the summer?